We’d love your help. Let us know what’s wrong with this preview of Spirit Warriors by D.E.L. Connor. In The Lamenting, Emme and her friends Jack, Ollie, Bets and Charlie are Spirit Warriors—teenagers who merge with spirit animals to fight the evil Machayiwiw, who’s brought tragedy to their families for generations. 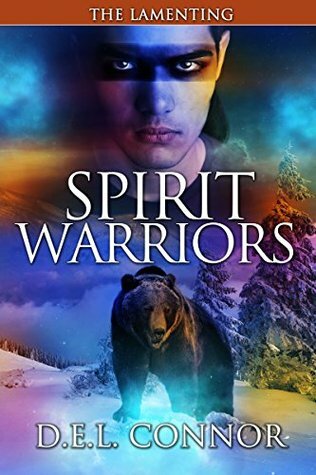 At the opening of Book Four of the Spirit Warriors series, we find Emme reeling from dehydration and hypothermia while Charlie recovers from a stab wound to th In The Lamenting, Emme and her friends Jack, Ollie, Bets and Charlie are Spirit Warriors—teenagers who merge with spirit animals to fight the evil Machayiwiw, who’s brought tragedy to their families for generations. At the opening of Book Four of the Spirit Warriors series, we find Emme reeling from dehydration and hypothermia while Charlie recovers from a stab wound to the heart. The friends vow to use their special abilities to conquer the Machayiwiw once and for all. Emme musters the courage to instigate a battle, but what she thinks will be a clean solution spirals out of control. Charlie has become more grizzly bear than human and his rage results in a canyon full of dead poachers while the Machayiwiw flees yet again. As the friends struggle to bring Charlie back from the wild, Emme realizes it’s Jack who she’s loved all along. Threats and perils escalate along with Emme’s romance. In this story of suspense, tenderness and tragedy, the friends, in both their animal and human forms, face the ultimate question: What are they willing to sacrifice to save one another? To ask other readers questions about Spirit Warriors, please sign up. I was given a book in exchange for an honest review free of persuasion from the author or anyone else affiliated with this book. The story continues with a wedding coming and the friends recovering from the aftermath of homecoming night. That night weighs heavily on everyone and no one came out unaffected. The love triangle between Emme, Charlie, and Jack is still strong. They continue to get ready for their final battle with the Machayiwiw. Once again I found myself devouring this book. I have b I was given a book in exchange for an honest review free of persuasion from the author or anyone else affiliated with this book. Once again I found myself devouring this book. I have been in love with this series since the first chapter. I feel so attached to these characters. My feelings for them are so strong. I hurt when Emme, Charlies, Bets, Jack, Archie, or Ollie hurt. I'm happy when they are happy. The author has bonded me to these characters and I feel like I'm apart of their friendship. I think this book is a perfect for the rest of the series. You get a better insight to each of the characters. My favorite character is Jack. I think he has such a pure soul. I love to watch him fall and stay in love with Emme. He is thoughtful and generous. I was skeptical of him at first but now he seems to belong. The wedding was my favorite part. I was bawling from happiness during the flower exchange. It was a pure and raw moment that I plan on remembering forever. I can't wait to see how Boreas turns out out. All the animals have a special place in my heart and feel like I need to pick a favorite animal. My favorite animal is Hercules. He is strong and powerful and plays a major role. I just really like him. The lead character is seventeen year old Emme, she and Rating 3.5 stars. The book opens with a dual tragedy, Emme's father and two close friends have recently died in a house fire and Emme and Charlie are recovering from an attack by the Machayiwiw. Charlie's human spirit is still in Hercules a grizzly bear, but his body is in hospital, time is running out for Charlie unless they can reunite them. Throughout the series Emme is torn between her love for Charlie whom she's known since childhood and her new love for Jack who she intends to marry. The inevitable love triangle causes frictions within the group. I really enjoyed this book. Following the third book in this series, Emme and her group of friends are slowly putting the pieces together after all the bad things that have happened to them lately, and beginning to start planning for Emme and Jack's wedding. With Charlie out of her life and living out in the wild now, and her love for Jack finally at a point where she knows she can't live without him, can Emme still do what she is destined to do knowing that some, if not all, of her friends may I really enjoyed this book. Following the third book in this series, Emme and her group of friends are slowly putting the pieces together after all the bad things that have happened to them lately, and beginning to start planning for Emme and Jack's wedding. With Charlie out of her life and living out in the wild now, and her love for Jack finally at a point where she knows she can't live without him, can Emme still do what she is destined to do knowing that some, if not all, of her friends may be killed? Will be interesting to read the next in the series to see what happens next, and how the author will end this series. Lemme, Jack, Betsy, Charlie, and Ollie are still holding their ground on the evil spirit. The spirit warriors have found that Jack does truly belong with their group. As they gain one will they lose another?